The Los Alamos Crestone Project is part of the Department of Energy’s (DOE) Accelerated Strategic Computing Initiative, or ASCI Program. 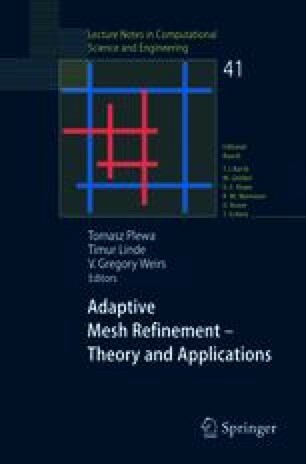 The main goal of this software development project is to investigate the use of continuous adaptive mesh refinement (CAMR) techniques for application to problems of interest to the Laboratory. There are many code development efforts in the Crestone Project, both unclassified and classified codes. In this overview I will discuss the unclassified SAGE and the RAGE codes. The SAGE (SAIC adaptive grid Eulerian) code is a one-, two-, and three-dimensional, multimaterial, Eulerian, massively parallel hydrodynamics code for use in solving a variety of high-deformation flow problems. The RAGE CAMR code is built from the SAGE code by adding various radiation packages, improved setup utilities, and graphics packages. It is used for problems in which radiation transport of energy is important. The goal of these massively-parallel versions of the SAGE and RAGE codes is to run extremely large problems in a reasonable amount of calendar time. Our target is scalable performance to ∼10,000 processors on a 1 billion CAMR computational cell problem that requires hundreds of variables per cell, multiple physics packages (e.g., radiation and hydrodynamics), and implicit matrix solves for each cycle. A general description of the RAGE code has been published in , ,  and . Currently, the largest simulations we do are three-dimensional, using around 500 million computation cells and running for literally months of calendar time using ∼2000 processors. Current ASCI platforms range from several 3-teraOPS supercomputers to one 12-teraOPS machine at Lawrence Livermore National Laboratory, the White machine, and one 20-teraOPS machine installed at Los Alamos, the Q machine. Each machine is a system comprised of many component parts that must perform in unity for the successful run of these simulations. Key features of any massively parallel system include the processors, the disks, the interconnection between processors, the operating system, libraries for message passing and parallel I/O, and other fundamental units of the system. We will give an overview of the current status of the Crestone Project codes SAGE and RAGE. These codes are intended for general applications without tuning of algorithms or parameters. We have run a wide variety of physical applications from millimeter-scale laboratory laser experiments, to the multikilometer-scale asteroid impacts into the Pacific Ocean, to parsec-scale galaxy formation. Examples of these simulations will be shown. The goal of our effort is to avoid ad hoc models and attempt to rely on first-principles physics. In addition to the large effort on developing parallel code physics packages, a substantial effort in the project is devoted to improving the computer science and software quality engineering (SQE) of the Project codes as well as a sizable effort on the verification and validation (V&V) of the resulting codes. Examples of these efforts for our project will be discussed.